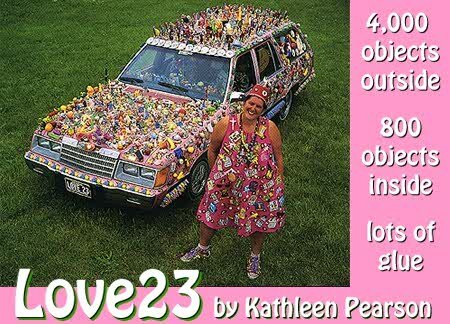 Love 23 is a 1983 Ford LTD Station wagon covered with toys inside and out! Originally created in June, 1990, Kathleen Pearson has been working on this car for over 7 years now. When she's not in her studio in Bisbee, Arizona, Kathleen is traveling around the country in Love 23 sharing her art with people along the way. 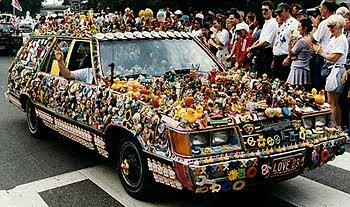 Kathleen attends The Orange Show Art Car Weekend every year, and in 1998 brought her new car to Houston - The Pennsylvania Dutchie. Kathleen is a talented artist working in a variety of mediums from cars to fabric and clothes design. She even finds time to paint memories of her travels with Love 23. Click on the images below for a better view! Kathleen also has a nifty web site created by John Marc Bimonte. Check it out!